Coach's Corner - Tris Speaker hand signed 1939 FDC Cachet! Go Back to Lot List Tris Speaker hand signed 1939 FDC Cachet! 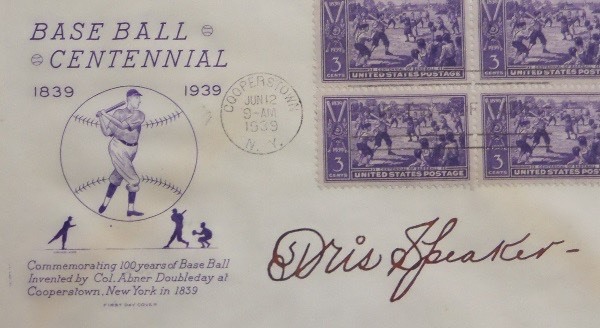 This June 1, 1939 Cooperstown NY stamped First Day Of Issue Cachet commemorates 100 Years Of Baseball, and comes hand-signed in dark red fountain pen ink by one of the greatest to ever play the game, Red Sox/Indians HOF center fielder, Tris Speaker. This is truly one of the finest signatures I've ever seen from The Grey Eagle, grading a nearly flawless 9, and on this unique cachet, it really stands out well. Valued into the high hundreds from this 1937 Inductee!